Alcohol and chlorine free, these multi surface wipes eradicate all major pathogen groups including; mycobacterium terrae, clostridium difficile, candida albicans, norovirus & MRSA. Used to clean and disinfect hard surfaces, non invasive medical devices & equipment, these wipes have been scientifically tested to British and European standards. 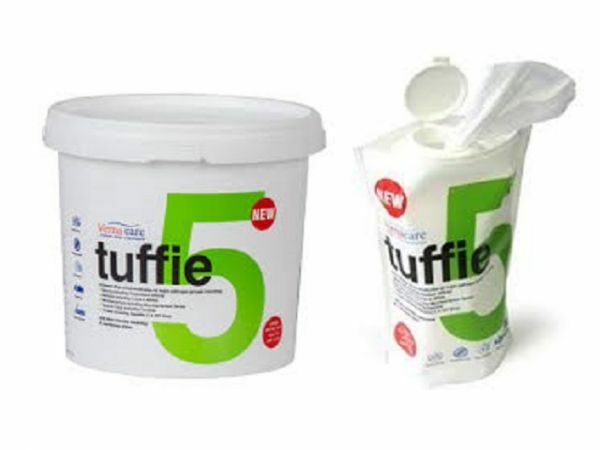 With an easy to close lid, Tuffie 5 wipes will not dry out. Available in a Flexican of 150 wipes, or a Bucket of 225.